, the first of an eminent family of learned men in Scotland, was the son of the Rev. Mr. John Gregory, minister of Drumoak in the county of Aberdeen, and was born at Aberdeen in November 1638. His mother was a daughter of Mr. David Anderson of Finzaugh, or Finshaugh, a gentleman who possessed a singular turn for mathematical and mechanical knowledge. 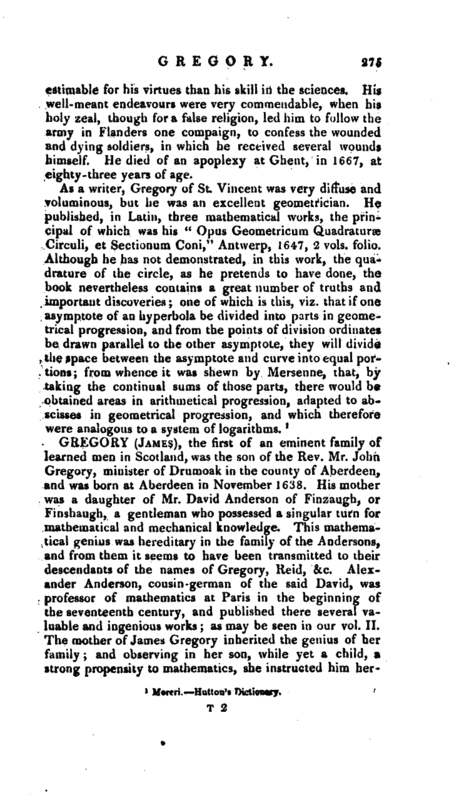 This mathematical genius was hereditary in the family of the Andersons, and from them it seems to have been transmitted to their descendants of the names of Gregory, Reid, &c. Alexander Anderson, cousin -german of the said David, was professor of mathematics at Paris in the beginning of the seventeenth century, and published there several valuable and ingenious works; as may be seen in our vol. II. The mother of James Gregory inherited the genius of her family; and observing in her son, while yet a child, a itrong propensity to mathematics, she instructed him | herself in the elements of that science. 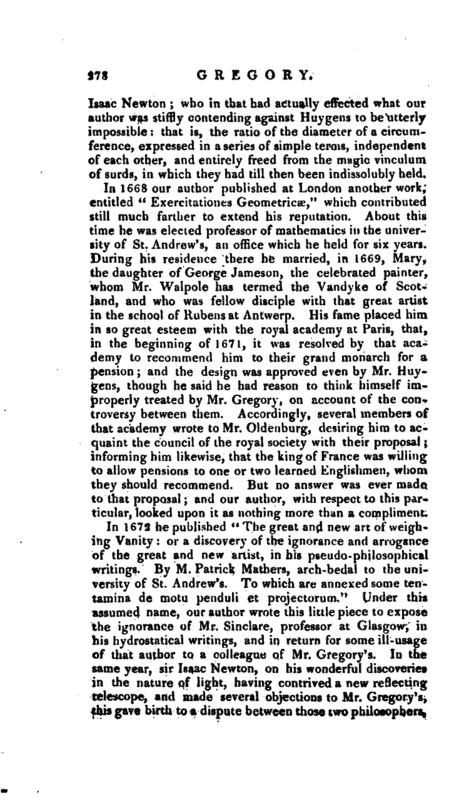 His education in the languages he received at the grammar-school of Aberdeen, and went through the usual course of academical studies at Marischal college, but was chiefly delighted with philosophical researches, into which a new door had been lately opened by the key of the mathematics. Galileo, Kepler, and Des Cartes were the great masters of this new method; their works, therefore, Gregory made his principal study, and began early to make improvements upon their discoveries in optics. The first of these improvements was the invention of the reflecting telescope, which still bears his name; and which was so happy a thought, that it has given occasion to the most considerable improvements made in optics, since the invention of the telescope. He published the construction of this instrument in his “Optica promota,” 1663, at the age of twenty-four. This discovery soon attracted the attention of the mathematicians, both of our own and foreign countries, who immediately perceived its great importance to the sciences. But the manner of placing the two specula upon the same axis appearing to Newton to be attended with the disadvantage of losing the central rays of the larger speculum, he proposed an improvement on the instrument, by giving an oblique position to the smaller speculum, and placing the eye-glass in the side of the tube. 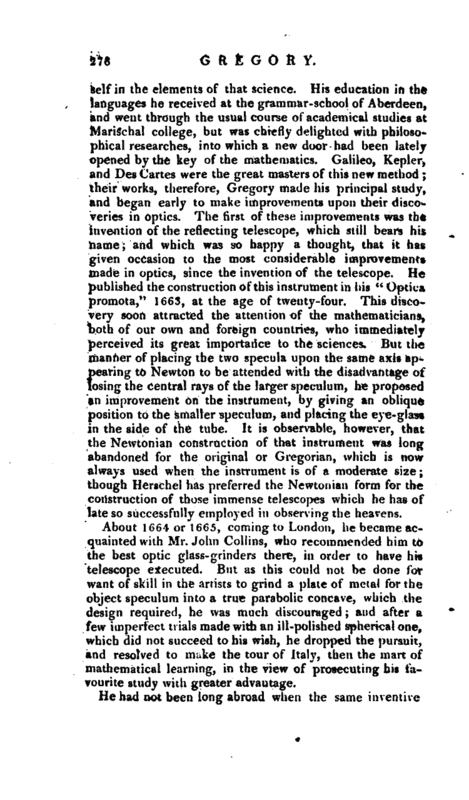 It is observable, however, that the Newtonian construction of that instrument was long abandoned for the original or Gregorian, which is now always used when the instrument is of a moderate size; though Herschel has preferred the Newtonian form for the construction of those immense telescopes which he has of late so successfully employed in observing the heavens. About 1664 or 1665, coming to London, he became acquainted with Mr. John Collins, who recommended him to the best optic glass-grinders there, in order to have his telescope executed. But as this could not be done for want of skill in the artists to grind a plate of metal for the object speculum into a true parabolic concave, which the design required, he was much discouraged; and after a few imperfect trials made with an ill-polished spherical one, which did not succeed to his wish, he dropped the pursuit, and resolved to make the tour of Italy, then the mart of mathematical learning, in the view of prosecuting his fa* vourite study with greater advantage. He had not been long abroad when the same inventive | genius, which had before shewn itself in practical mathematics, carried him to some new improvements in the speculative part. The sublime geometry on the doctrine of curves was then hardly passed its infant state, and the famed problem of squaring the circle still continued a reproach to it; when our author discovered a new analytical method of summing up an infinite converging series, by which the area of the hyperbola, as well as the circle, may be computed to any degree of exactness. He was then at Padua; and getting a few copies of his invention printed there in 1667 under the title “Vera Circuli et Hyperbolae Quadratura,” he sent one to his friend Mr. Collins, who communicated it to the royal society, where it met with the commendation of lord Brounker and Dr. Wallis. He reprinted it at Venice, and published it the following year, 1668, together with another piece entitled “Geometric pars universalis, inserviens quantitatum curvarum transmutationi et mensurae,” in which he is allowed to have shewn, for the first time, a method for the transmutation of curves. These works engaged the notice, and procured the author the correspondence of the greatest mathematicians of the age, Newton, Huygens, Wallis, and others. 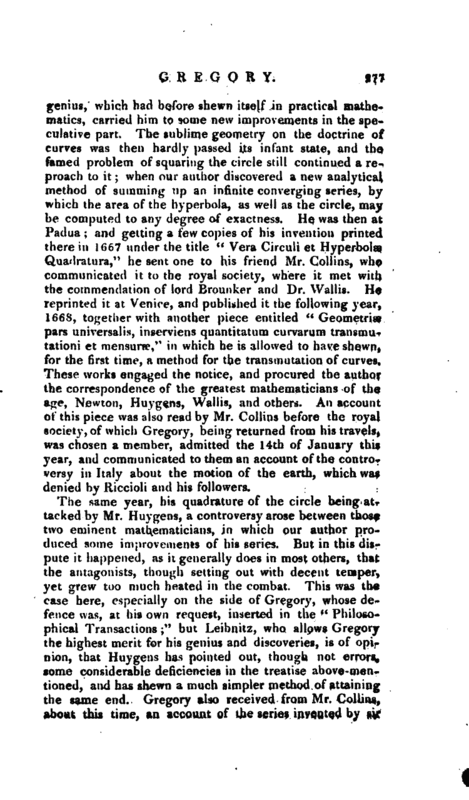 An account of this piece was also read by Mr. Collins before the royal society, of which Gregory, being returned from his travels, was chosen a member, admitted the 14th of January this year, and communicated to them an account of the controversy in Italy about the motion of the earth, which was denied by Riccioli and his followers. The same year, his quadrature of the circle being attacked by Mr. Huygens, a controversy arose between those two eminent mathematicians, in which our author produced some improvements of his series. But in this dispute it happened, as it generally does in most others, that the antagonists, though setting out with decent temper, yet grew too much heated in the combat. This was the case here, especially on die side of Gregory, whose defence was, at his own request, inserted in the “Philosophical Transactions;” but Leibnitz, who allows Gregory the highest merit for his geniui and discoveries, is of opinion, that Huygens has pointed out, though not errors, some considerable deficiencies in the treatise above-mentioned, and has shewn a much simpler method of attaining the same end. 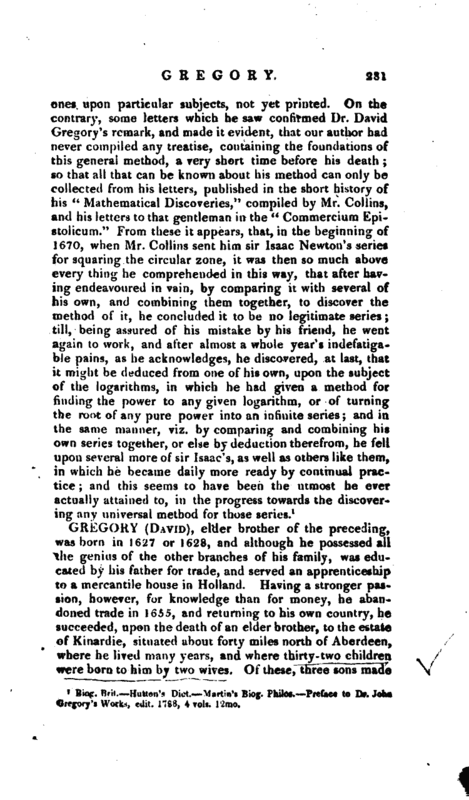 Gregory also received from Mr. Collins, about this time, an account of the series invented by sir | Isaac Newton; who in that had actually effected what our author was stiffly contending against Huygens to be utterly impossible: that is, the ratio of the diameter of a circumference, expressed in a series of simple terms, independent of each other, and entirely freed from the magic vinculum of surds, in which they had till then been indissolubly held. In 1668 our author published at London another work, entitled “Exercitationes Geometricae,” which contributed still much farther to extend his reputation. About this time he was elected professor of mathematics in the university of St. Andrew’s, an office which he held for six years. During his residence there he married, in 1669, Mary, the daughter of George Jameson, the celebrated painter, whom Mr, Walpole has termed the Vandyke of Scotland, and who was fellow disciple with that great artist in the school of Rubens at Antwerp. His fame placed him in so great esteem with the royal academy at Paris, that, in the beginning of 1671, it was resolved by that aca^ demy to recommend him to their grand monarch for a pension; and the design was approved even by Mr. Huygens, though he said he had reason to think himself improperly treated by Mr. Gregory, on account of the controversy between them. Accordingly, several members of that academy wrote to Mr. Oldenburg, desiring him to acquaint the council of the royal society with their proposal; informing him likewise, that the king of France was willing to allow pensions to one or two learned Englishman, whom they should recommend. But no answer was ever made to that proposal; and our author, with respect to this particular, looked upon it as nothing more than a compliment. In 1672 he published “The great and new art of weighing Vanity or a discovery of the ignorance and arrogance of the great and new artist, in his pseudo-philosophical writings. By M. Patrick Mathers, arch-bedal to the university of St. Andrew’s. 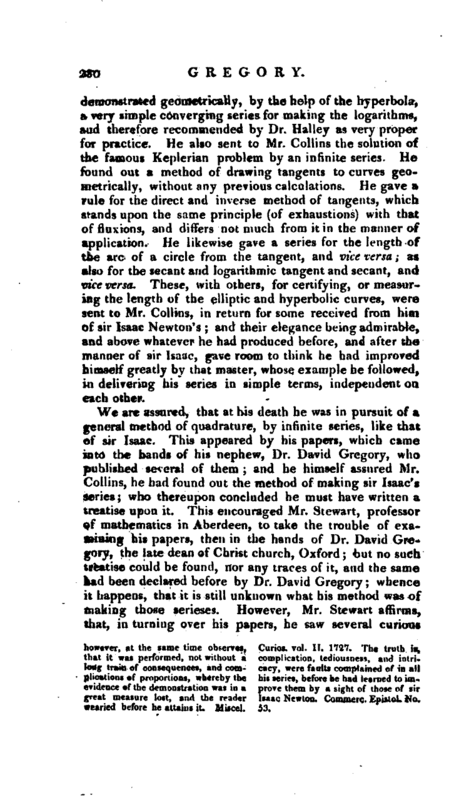 To which are annexed some tentamina de motu penduli et projectorum.” Under this assumed name, our author wrote this little piece to expose the ignorance of Mr. Sinclare, professor at Glasgow, in his hydrostatical writings, and in return for some ill-usage of that author to a colleague of Mr. Gregory’s. In the same year, sir Isaac Newton, on his wonderful discoveries in the nature of light, having contrived a new reflecting telescope, and made several objections to Mr. Gregory’s, this gave birth to a dispute between those two philosophers, | which was continued during that and the following year, in the most amicable manner on each side; Mr. Gregory defending his own construction so far, as to give his antagonist the whole honour of having made the catoptric telescopes preferable to the dioptric; and shewing, that the imperfections in these instruments were not so much owing to a defect in the object-speculum as to the different refrangibility of the rays of light. In the course of this dispute, our author described a burning concave mirror, which was approved by sir Isaac, and is still in good esteem. Several letters that passed in this dispute are printed by Dr. Desaguliers, in an appendix to the English edition of Dr. David Gregory’s “Elements of Catoptrics and Dioptrics.” All this while he attended the proper business of his professorship with great diligence, which taking up the greatest part of his time, especially in the winter season, interrupted him in the pursuit of his proper studies. These, however, led him to farther improvements in the invention of infinite series, which he occasionally communicated to his intimate friend and correspondent Mr. Collins. 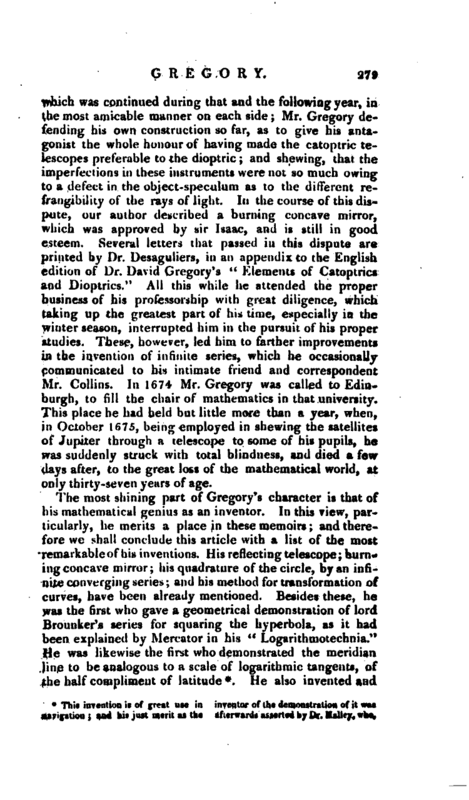 In 1674 Mr. Gregory was called to Edinburgh, to fill the chair of mathematics in that university. This place he had held but little more than a year, when, in October 1675, being employed in shewing the satellites of Jupiter through a telescope to some of his pupils, he was suddenly struck with total blindness, and died a few days after, to the great loss of the mathematical world, at only thirty-seven years of age. however, at the same time observes, that it was performed, not without a long tram of consequences, and complications of proportions, whereby the the evidence ef the demonstration was in a great measure lost, and the reader wearied before he attains it. Curios, vol. II. 3727. The truth is, complication, tediousness, and intricacy, were faults complained of in all series, before he had teamed to improve them by a sight of those of sir Isaac Newton. Commerc. Epistol. No. Miscel. 53. He also invented and | demonstrated geometrically, by the help of the hyperbola, a very simple converging series for making the logarithms, and therefore recommended by Dr. Halley as very proper for practice. He also sent to Mr. Collins the solution of the famous Keplerian problem by an infinite series. He found out a method of drawing tangents to curves geometrically, without any previous calculations. He gave a rule for the direct and inverse method of tangents, which stands upon the same principle (of exhaustions) with that of fluxions, and differs not much from it in the manner of application. He likewise gave a series for the length of the arc of a circle from the tangent, and v ice versa; as also for the secant and logarithmic tangent and secant, and vice versa. These, with others, for certifying, or measuring the length of the elliptic and hyperbolic curves, were sent to Mr. Collins, in return for some received from him of sir Isaac Newton’s; and their elegance being admirable, and above whatever he had produced before, and after the manner of sir Isaac, gave room to think he had improved himself greatly by that master, whose example he followed, i delivering his series in simple terms, independent on each other. 1 Biajr. 71rit.--Hu*tii’s Dict. Martin’s Biog, Phi log. -Preface to Dr. John Gregory’s Works, edit. 1788, 4 vols. l'2mo.